Melissa Kunz (HWMO/PFX) talks to community members at the outreach table. The Governor of Hawaii, David Ige, who took office in 2014, paid a visit to Kailua-Kona along with his cabinet members to hold a town hall meeting with West Hawaii community members. 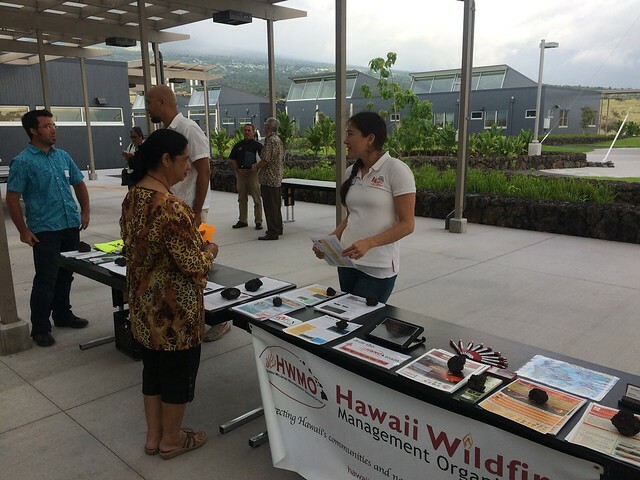 Pablo Beimler, HWMO Community Outreach Coordinator, and Melissa Kunz, HWMO/PFX Coordination Assistant, set-up an outreach booth next to the registration tables to get people informed about wildfire readiness. Many of the over 100 attendees of the event stopped by the table to pick up a copy of the Ready, Set, Go! Wildland Fire Action Guide or to share their research needs with Melissa. Even David Smith, DLNR Division of Forestry and Wildlife Administrator, stopped by to offer his input. Various community members shared previous close-calls with wildfires in their neighborhoods. The mix of people and stakeholders made the event a worthwhile one for HWMO and PFX to be a part of.